The University of Wisconsin-Madison is the largest four-year school in the state and also located within our capital city. 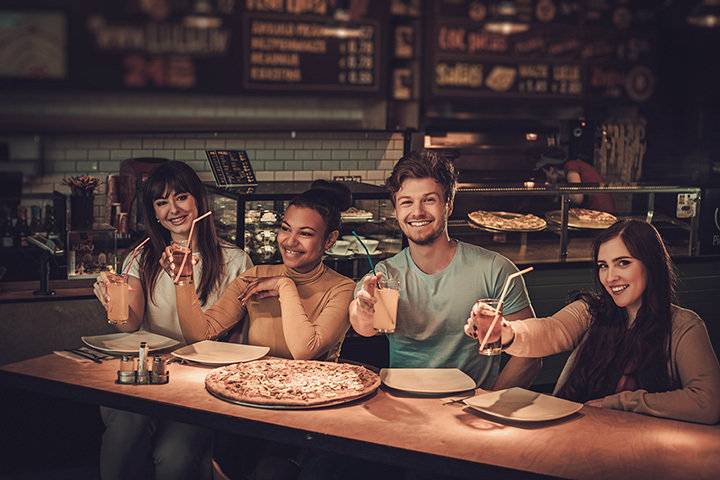 Naturally there are tons of places to eat, but we’ve got the inside scoop of some of the best late-night food spots near campus. Ian’s Pizza in Madison is loved by many Madisonites. Not only do they serve delectable pizzas, but they are open until 2:30 a.m. most nights. On top of your typical cheese and pepperoni, you’ll find Buffalo chicken and a fan favorite—mac and cheese pizza options! Parthenon serves late night gyros and other Greek classics. They’re open until 3 a.m. on the weekends which allows for lots of late night snacking. Parthenon was voted “Best of Madison” for takeout and Mediterranean this year. Stop by this weekend for the best in Greek eats. Who doesn’t like chicken wings? Not to mention chicken wings late at night. Wings Over Madison is open until 1 a.m. most nights and 3 a.m. on the weekends. Listen to your stomach and treat yourself to chicken wings, salad, wraps, ribs, and other tasty desserts. Dotty Dumpling’s Dory is a classy bar and pub located in down town Madison. On the weekends, they are open until midnight. Over the years, they have been voted “Best in Madison” and featured in The New York Times. Enjoy some of the best food late at night. The Old Fashioned is a classic for anyone living in Madison. Open until 1:30 a.m. most nights and 2 a.m. on the weekends, their menu is filled with Wisconsin lovin’ recipes. Order up a classy Old Fashioned and a basket of cheese curds for some of the best eats in the state. The Great Dane is a lovely bar and restaurant located in downtown Madison. It’s not only the perfect place to get the party started but also an excellent spot to order some tasty food late at night. Their downtown location is open until 2:30 a.m. on weekends. Order up. Nitty Gritty has been better known as the center for celebrating birthdays. What you might not know is that the Nitty Gritty is the perfect spot to order late night appetizers and pub fare. Stop by the Nitty—open until 1 a.m. on the weekends! Burrito Drive serves burritos with creative fillings. Open late, this burrito joint offers delivery, dine-in, and carry out. Order enchiladas, appetizers, tacos, quesadillas, chimichangas, and salads. They are open until 3 a.m. every day! Come Back In is an old-school bar right in the heart of down town Madison. Enjoy all the great things about beer, music, and food—late at night. Come Back In is open until 2 a.m. most nights and 2:30 a.m. on Saturdays. Order any of their foods for a tasty treat tonight. The Tipsy Cow is another great spot in Madison to grab some late-night food. They are open until 2 a.m. most nights and have a wide array of appetizers, sandwiches, dessert, and more. Located right off the Capital Square—the Tipsy Cow is loved by many UW Madison students.